Are there any exemptions to vaccinations left in California? On July 1, 2016, one of the most fiercely-contested pieces of legislation went into effect in California-- the vaccination law known as Senate Bill 277. 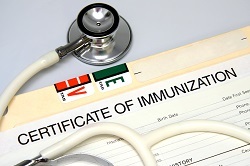 The passage of SB 277 effectively eliminated the long-standing and frequently cited personal and religious belief exemptions from childhood vaccination requirements. Effective immediately, California schools cannot admit new students or advance students into the seventh grade without proof of vaccination. The only way around the vaccination requirement is a medical excuse, such as leukemia or other conditions for which vaccination would be contraindicated. This ban has outraged those who believe that the vaccination decision should be between the parents and the doctor--with the parents having the right to ultimately decide whether, and on what schedule, to vaccinate. Some parents oppose all vaccines, others oppose some, and still others just want them spread out over time instead of clustered. Parents opposed to vaccinations, often referred to as “anti-vaxxers”, often believe reports of-- or have personally witnessed-- the horrific and permanent damage or death that vaccinations can cause to vulnerable children. They may seek to prevent their younger children from suffering a similar fate as an older child who was vaccine-injured, or to prevent further damage to the already vaccine-injured child. Sadly, it can’t be known with absolute certainty which child will react badly to a vaccine’s often toxic ingredients until after the injection—or multiple injections-- is given and the reaction occurs. By then, it is too late. The damage is done. A perfectly healthy child may die or be transformed into one with severe life-long physical and cognitive disabilities and special needs. In addition to the personal choice argument, opponents of the vaccine law contend that a child’s vaccination status shouldn’t prevent them from attending school. This is the ground on which an upcoming repeal effort by the group A Voice for Choice will be based. While the battle over exemptions in California rages on, the injury toll on vulnerable children continues as well. If you or someone you love has experienced a vaccine-related injury, you may be entitled to compensation under the National Vaccine Injury Compensation Program (VICP). At the Law Offices of Leah V. Durant, PLLC, we provide no-cost legal representation for individuals suffering from vaccine-related injuries, nationwide. For more information about how to file a claim, contact us by calling: (202) 800-1711 or by requesting a contact to speak with our vaccine attorney today.